Handsome young Caucasian businessman speaking at multiethnic office meeting in loft trendy coworking slow motion. 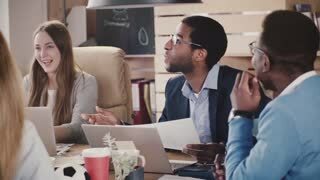 Happy African American company boss leading creative discussion at multiethnic meeting in loft office slow motion. Happy multiethnic team listening to unrecognizable male executive, smiling at office meeting slow motion close-up. Cheerful happy female executive inspiring and encouraging happy multiethnic colleagues at meeting in modern loft office.